A recent favorite purchase for this summer has been the Delonghi CGH800-U Retro Panini Grill for sandwiches, Panini, even meat / vegetables. First thing that caught my eye was that on eBay and Amazon, this Delonghi Panini Grill was 65% off it’s regular price. Also the near perfect reviews, and the ones that gave it a 4 rating were generally nitpicking. The first few uses brought out what we had already assumed. The panini grill locks into place and puts a firm amount of pressure on the bread. Since it is not a flat top one would assume it does not heat evenly, but the pressure from the lock-down top makes up for this. Most of the negatives with other competitor panini grills like the George Foreman is that they do not put enough pressure on the bread, thus the insides are not being cooked as well as they could be (and the cooking temp is just not high enough), and the lack of pressure shows with the non existent grill marks on the bread most of the time. Cleanup is simple with a wet wipe on the non stick area. A more intense washing is needed if you are grilling chicken or other meat on there. Cheese and other run on ingredients are easy to come off again because of the non stick. Not much comes out as once the sandwich is locked down from the top and your food does not relocate. Like an oven, the Delonghi CGH800 Panini Grill has a light that flashes on once the ideal temperature is hit. Only a few minutes is needed to heat up as well. And with the dial you can change the temperature when you want to slow down / speed up the cooking. One confusing thing about the Delonghi Panini is that there is no off / on switch! So you are either going to have to unplug it straight from the wall or have it into a surge protector or something similar to just shut the power off, but it is a rare negative for this machine. As stated above, the Delonghi CGH800 Retro Panini Grill went on sale as summer got near and we picked it up for 51$, which is 88$ off what it normally is at Amazon (140$). Plus Amazon FREE SHIPPING which is always a treat. A friend who had told us of the product found it on eBay for around 55$ just a bit earlier. As usualy with eBay you can find some deals that are lower than the static deals you find at places like Amazon. 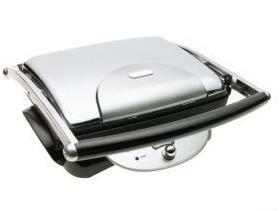 Get Delonghi Panini Grill by FREE eBay signup here to start.